Jul 23, 2014 @ 09:00 AM — by Sharon B. Mateja, D.D.S. Missing teeth can take the joy out of many things: smiling, eating, talking. Fortunately, custom dentures can replace missing teeth to restore dental function, allowing you to eat in comfort and smile with confidence. Restorative dentistry treatments, like custom dentures, can dramatically improve oral health and appearance. 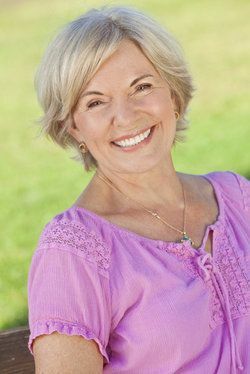 To find out if custom dentures are right for you, we invite you to schedule a consultation with Rancho Cucamonga dentist Sharon Mateja. Custom dentures are crafted to the requirements of each patient. Impressions are taken of the patient's mouth so the dentures can be custom made for the patient. Dentures consist of an acrylic base, designed to look like the natural gums, and artificial teeth. Though there are different types of dentures to treat the replacement of either a full set of teeth or portions of missing teeth, all dentures can be custom made. A complete set of dentures can be made to replace all of the top and bottom teeth. For those with some natural teeth remaining, a partial denture may be most suitable. Overdentures are another form of tooth replacement. An overdenture can be used when there are a few natural teeth remaining. These teeth provide support to the denture. Implant-supported dentures are also an option for total tooth replacement. Implant-supported dentures involve the use of surgically placed dental implants to anchor the dentures in place. Custom dentures can improve quality of life, allowing you to eat and smile without fear of pain or embarrassment. Though the benefits of replacing missing teeth with dentures are endless, here are just a few benefits custom denture patients can expect to enjoy. Missing teeth can make eating difficult, smiling embarrassing, and speaking slurred. Fortunately, you don't have to suffer from missing teeth. Custom dentures can transform the lives of those who suffer from missing teeth. Whether you are missing all of your teeth or multiple teeth, complete or partial dentures can help restore your smile. To find out if you're a candidate for custom dentures, or to discuss other treatment options, schedule a consultation with Dr. Mateja today!